Come and enjoy the fishing experience of a lifetime aboard the King Fisher, a 30 foot Baha Cruiser sport craft. U.S. Coast Guard licensed Captain Don Grasse, has over 30 years of experience fishing the beautiful waters around Gills Rock and Washington Island. 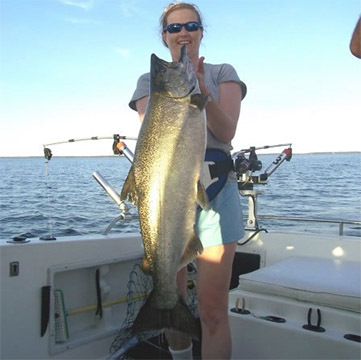 We provide all the tackle and knowledge to catch the hard fighting king salmon. I have fished with Captains and guides all over the world and have not experienced any better than the trip you provide, Steve J., Boulder, Colorado.